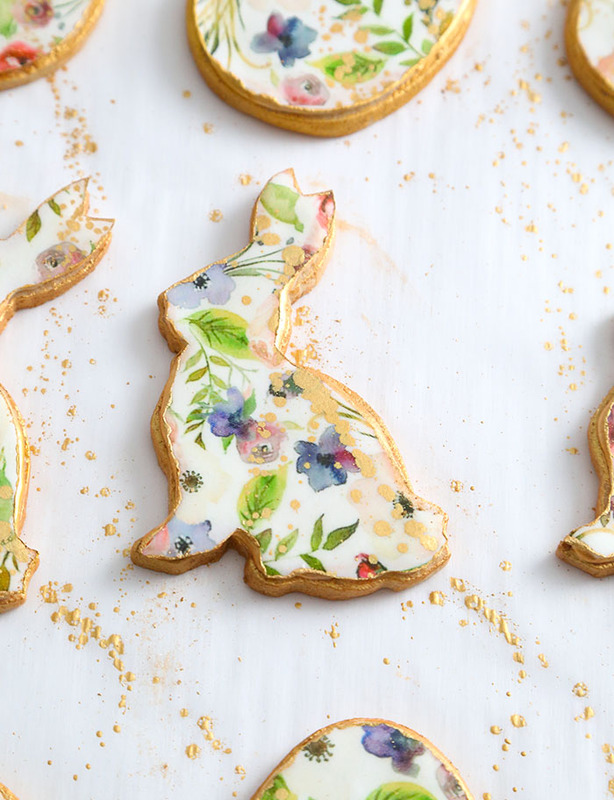 This recipe begins with my tried-and-true simple sugar cookie recipe from the Sprinkle Bakes book, and you'll need 5-inch rabbit and egg-shaped cookie cutters. Chances are very good that you can find these right now in the baking aisle at your local craft store. Here's one of my best tips for creating perfectly flat sugar cookies for decorating: As soon as the cookies are baked and removed from the oven, use a fondant smoother to gently press the surfaces completely flat. The cookies will not rise much because they contain no chemical leaven, but occasionally have a bubble or puffy area that needs smoothing. Smoothing the cookies provides the best even surface so flood royal icing stays put! That means less chance of the icing overflowing the edges. 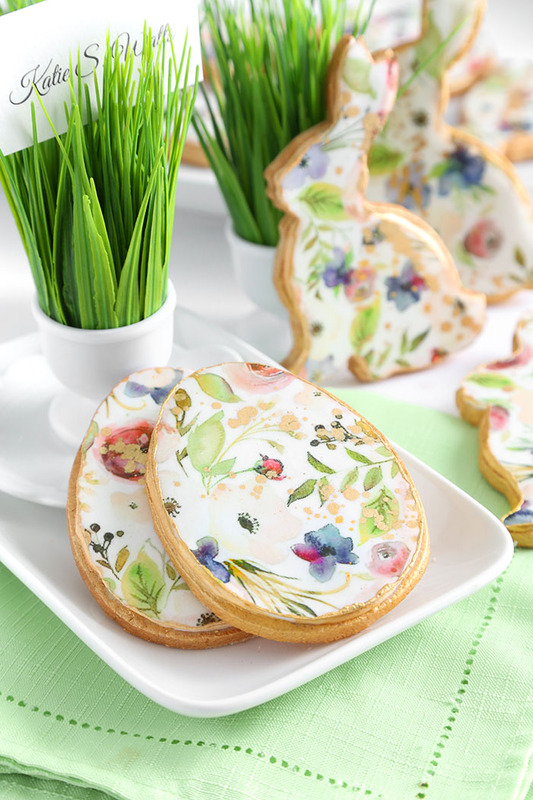 I used some beautiful watercolor print wafer paper on these cookies from this Etsy seller. 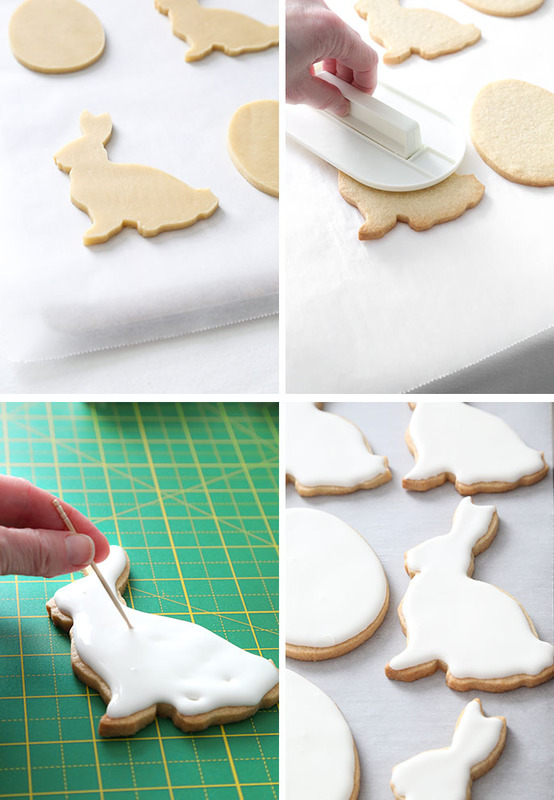 Use the same cookie cutters used for the dough as a template to cut out the wafer paper with an X-acto knife. 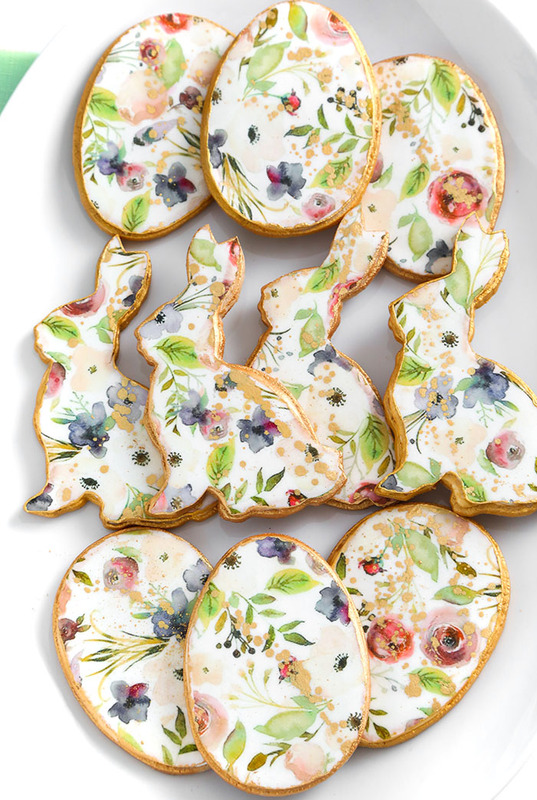 After the royal icing has completely dried on the cookies, cover each with a light layer of piping gel, and then place the corresponding shaped wafer paper on top. Turn the cookies upside down to dry completely, so the wafer paper lies perfectly flat. Use gold luster dust mixed with vodka to create a gold paint to finish the edges. I used the flat edge of a small art brush to swipe a line of paint onto the wafer paper edge, which created an almost cloisonne effect. Further thin the luster dust paint with drops of vodka, and use a larger brush to create gold paint spatter. To achieve this effect, dip the brush in the paint and fling it downward in a hard throwing motion. You'll need some space to do this, and make sure your table is well protected from wayward paint splashes! It won't take too long for the paint to set if the cookies are placed, uncovered, in a cool dry area. I think I waited about 30 minutes before handling them. These make such delightful little gifts. 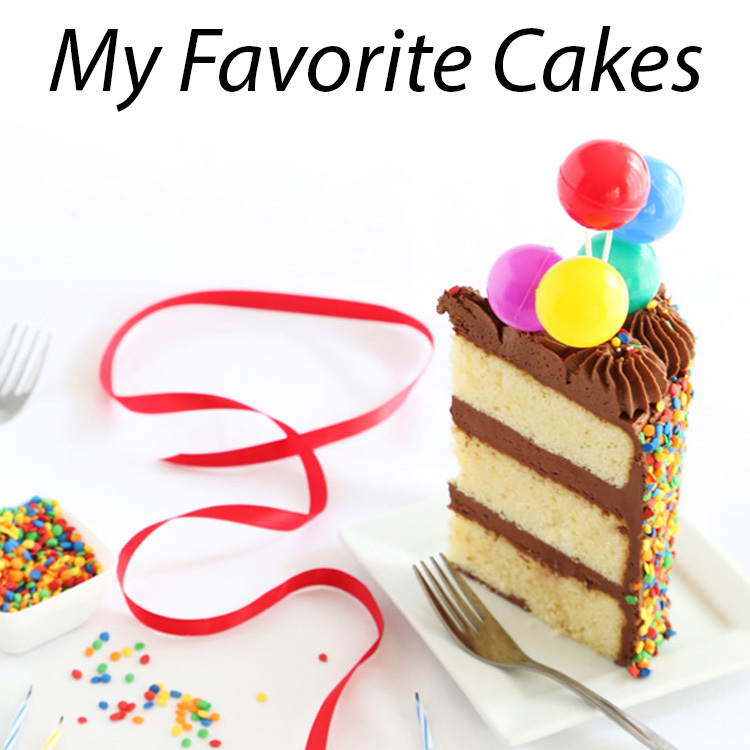 I flavored the royal icing on these with my current obsession - bergamot flavor (found in this set). It gives these cookies a citrusy flavor reminiscent of Earl Grey tea. They are just as delicious as they are pretty, and the wafer paper has no discernible flavor. 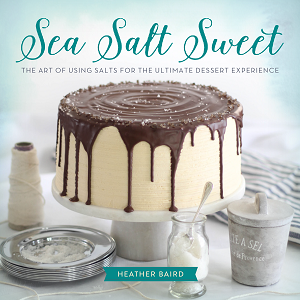 It melds with the royal icing and just tastes sweet. 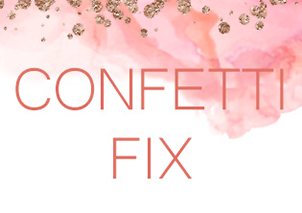 I'll be placing these on my table along with some cute grassy place card holders that I made, which you can find the tutorial for on our craft blog Confetti Fix. 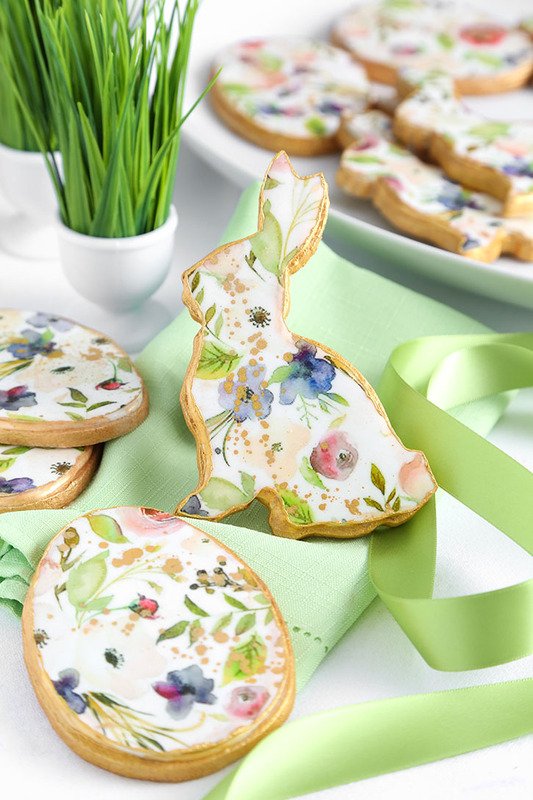 You’ll need 5-inch bunny and egg cookie cutters for this project, along with some floral print wafer paper. See blog post for resources. Use a 5 inch cutter to stamp shapes from the dough and transfer them to the prepared pans. Chill the shapes in the refrigerator for 15 minutes. Bake cookies for 12-15 minutes, or until the cookies are lightly brown on the edges. Transfer the cookies to a wire rack to cool completely. Note: Not all meringue powder is the same. Be sure to read the directions on the back of the meringue powder container for suggested amounts. In the bowl of an electric mixer fitted with the whisk attachment, stir the confectioners’ sugar and meringue powder on low speed until combined. Add the water and beat on medium-high speed until thickened. Mix in the flavoring. Scrape down the bowl and beat again. Mix in drops of water until the icing thins to flood consistency (It should be thick and pourable like a milkshake. 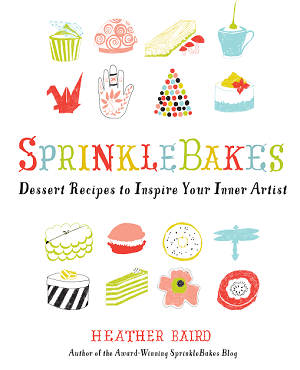 Run a spatula through the icing to check; the indention should disappear by the count of 10.) Use the icing immediately or drape a damp tea towel over the mixing bowl or bowls to prevent the icing from drying out. Using a disposable piping bag or a zip-top bag with a tiny hole snipped in the end, pipe a line of frosting around the outer edge of the cookies. Let stand for 1 minute. Flood the inside of the shape with more icing until completely covered and smooth. Let stand until dry, about 4 hours or overnight. 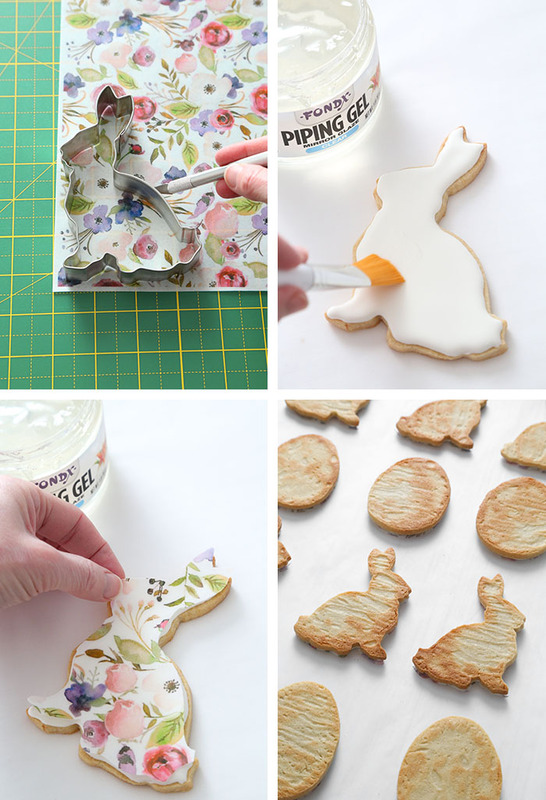 Use the same cookie cutters used for the dough as a template to cut out the wafer paper with an X-acto knife. 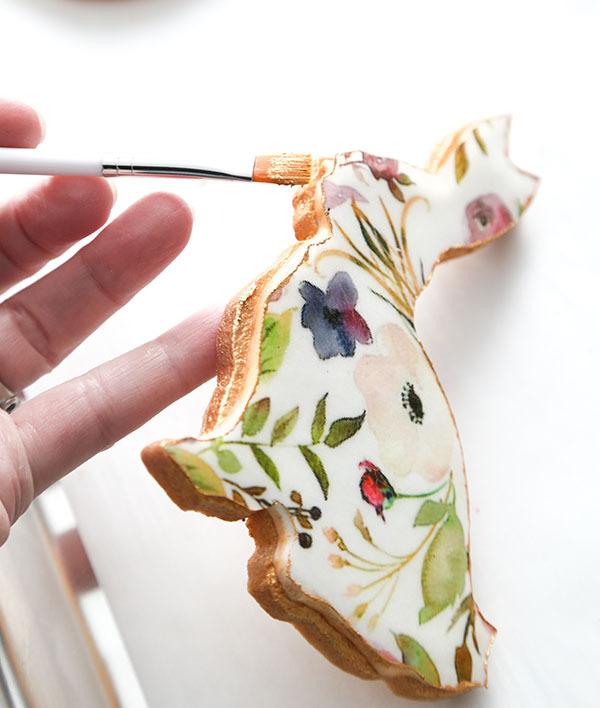 After the royal icing has completely dried on the cookies, brush each with a light layer of piping gel, and then place the corresponding shaped wafer paper on top. Turn the cookies upside down to dry completely, so the wafer paper lies perfectly flat. Mix gold luster dust with drops of vodka to create a medium-bodied gold paint. Paint it around the cookie edges to finish. Use the flat edge of a small art brush to swipe a line of paint onto the wafer paper edge also. Slightly thin the paint with drops of vodka, and then use a large brush dipped in the thinned paint to spatter the cookies with gold. Use a hard downward throwing motion to achieve a nice line of paint spatter. Allow the cookies to dry for 30 minutes to one hour, or until the gold paint is dry to the touch. Package in cellophane bags and arrange in an Easter basket for after dinner take-away favors, or use as table decorations at each place setting. Is the flavoring for the Royal Icing an oil? Oil and Royal Icing is a no-no, correct?? That's a very good point. The brand I used is Bakto, which has is labeled 'natural flavor' and oil is listed among other ingredients. My royal icing set fine, but I'm going to change the text to 'bergamot flavor' so no one experiences a baking fail. Thank you. OMG!!! You're such a genius! I just love seeing all your beautiful creations. I bought your book. Naive me, I thought you hand-painted each cookie! I was wondering where you'd find the time! 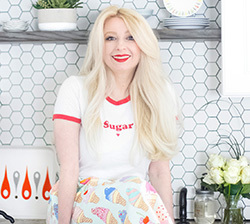 Thanks so much for teaching us how to recreate your beautiful cookies. These are gorgeous. I would have never known that was wafer paper and not hand-painted. These are absolutely precious! Such talent! You inspire.